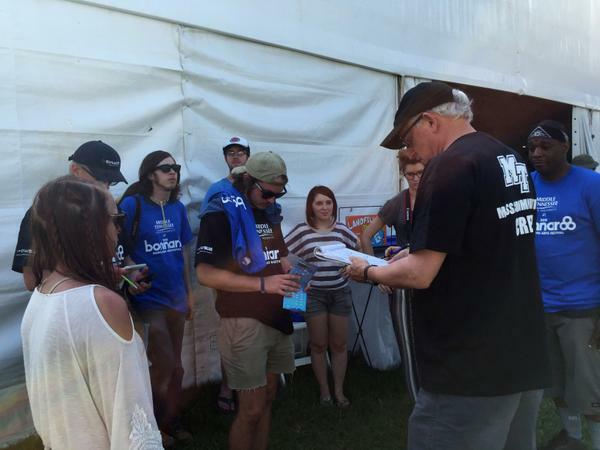 About 40 College of Mass Communication students, faculty and staff braved the heat and rain for the opportunity to promote 24/7 coverage of the 2015 Bonnaroo Music and Arts Festival. The four-day music celebration, held annually in Manchester, Tennessee, served as the ultimate classroom for MTSU students, who received hands-on training in journalism and video production for class credit. The majority of students worked the cameras and control boards for MTSU’s $1.7 million Mobile Production Lab, capturing performances on the festival’s Who Stage. The rest were hands-on multimedia journalists, filing stories and videos for area news media outlets including The Tennessean. Pat Embry, director of the John Seigenthaler Chair of Excellence in First Amendment Studies, joined Leon Alligood, associate professor in journalism (second from left), to make coverage assignments on the opening afternoon of Bonnaroo in front of the press tent. Journalism students included (from left): Kimi Taylor Thompson, John Connor Coulston, Matt Masters, Dylan Aycock, Meagan White and Gregory French. The mobile production lab, nicknamed “the truck” by students and faculty, looked like another large RV at the festival – but it was filled with state-of-the-art media equipment. Assistant Professor Bob Gordon, who specializes in multi-camera and special-event production, worked tirelessly to develop the shooting schedule. Twitter: Zach Galifianakis, left, and John Hamm, right, perform at the Bonnaroo Music and Arts Festival in Manchester, Tenn. On Saturday, June 13, 2015. This tweet and photo was captured by student reporter & photographer John Connor Coulston. Ken Paulson, Mass Comm dean, got a bird’s-eye view of the Who Stage while standing atop the mobile lab. This is the second year of a partnership Paulson brokered between MTSU and the organizers of the annual festival. Paulson said he is particularly proud of the Bonnaroo partnership that began last year. Bonnaroo founders Ashley Capps and Rick Farman visited the university in April 2014 and returned in October with fellow co-founder Jonathan Mayers and a contingent of Bonnaroo directors and organizers to talk about the mechanics of the event. On day one of the festival, Pat Embry, director of the John Seigenthaler Chair of Excellence in First Amendment Studies, joined Journalism Associate Professor Leon Alligood to make coverage assignments for journalism students right in front of Bonnaroo’s press tent. The burgeoning journalists, reporting for MTSU’s Seigenthaler News Service, interviewed artists and covered performances for exclusive quotes and footage. The students contributed a number of advance and breaking feature stories, mini-reviews and photographs for media client The Tennessean as well as the Murfreesboro Pulse and MTSU’s student newspaper, Sidelines. One such student, John Connor Coulston, found himself the sole media person in the comedy tent Saturday evening as the audience was treated to a surprise performance from Hangover star Zach Galifianakis during comedian Chris Hardwick’s set. Another unexpected cameo came when Mad Men star Jon Hamm joined Galifianakis on stage for a non-sequitur bit during which Galifianakis was a dog and Hamm was his owner, feeding him treats. 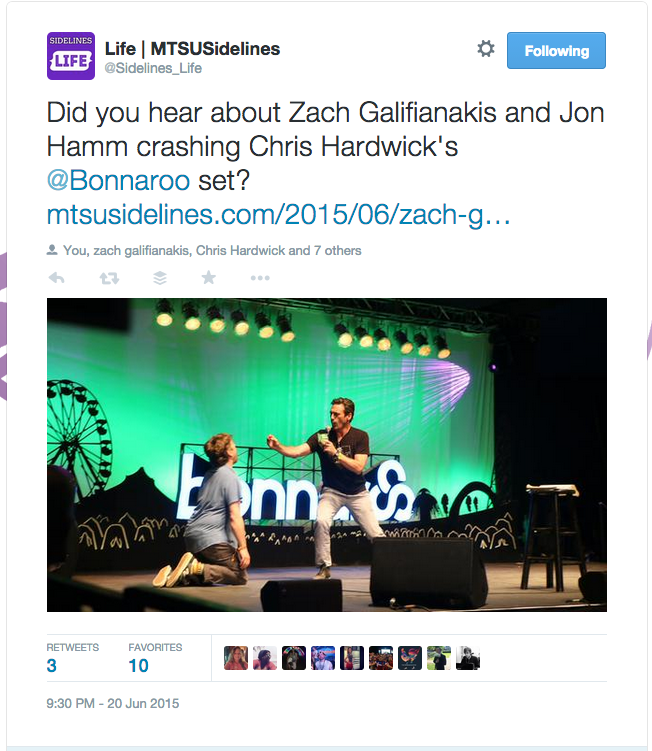 Coulston immediately captured images and wrote an article about Hamm and Galifianakis’s appearances, which was featured in The Tennessean. See Coulston’s article here.